Nick Duffill of Harport Consulting has been an avid user of mind mapping software since 1994 and has created dozens of solutions for MindManager users, including GyroQ, the #1 most popular third-party extension for MindManager. He co-founded and moderates the MindManager Users Group on Yahoo, and co-founded both MindManuals.com and Gyronix. He was the technical editor for Wiley's "MindManager for Dummies" and writes about techniques with mind mapping software at www.beyond-mind-mapping.com, as well as developing custom solutions for MindManager. 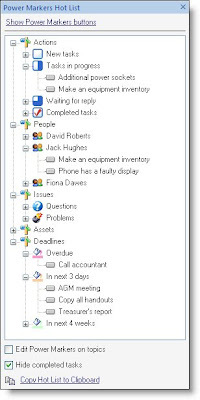 In recent years “Mind Mapping” software has expanded rapidly into productivity management and information management, with most products offering some form of graphical labelling and task management capabilities ranging from simple icons through to fully featured Gantt charts. But the tree-shaped diagrams created by mind mapping software are poorly adapted to handling these extra layers of information hung on the topics. How does this problem arise, and how can we solve it? Let’s go right back to basics. A topic in a map has a number of “properties” that combine together to represent something meaningful. Its primary “property” is the parent topic to which it belongs. This sets the context, which delivers the majority of the meaning in a map. It is the visualization and manipulation of context that sets visual mapping apart from most other ways of conveying information, and adds substantial value. • adding a hyperlink or an attached document. These properties enrich the topic and tell us more about it. 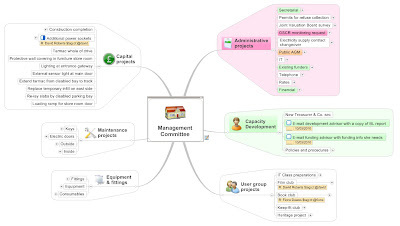 Further, using the same marker on several topics creates a grouping across the map, so that the presence of a marker tells us that the topic also belongs to other groups, e.g. “Priority 1 items” or “Finance Department items”. The advantage of these properties is that you can apply several of them to the same topic; a topic can belong to multiple groups at the same time. Compare this to the primary property of context (the parent topic); a topic can have one and only one parent, unless it is the central topic, which does not have a parent. Topics cannot have multiple parents - after all, this is what makes a tree a tree. So it is very handy to have so many ways for a topic to be a member of other cross-tree groupings as well. • We can look at the map and visually recognise markers, with reference to a legend to explain them if necessary (and if available). • The software can help us to look in a more focused way by filtering out the parts of the map that don’t carry the markers we are interested in (unless they are in the path to the central topic). This removes the context surrounding the topics of interest, making them easier to spot. In both cases, we need to change our mindset to stop looking at the map as a whole, and try to see it as a list - but the list only exists in our minds. Whichever way you slice it and dice it, the information in our map is still a tree, dominated by the context property. It relies on our concentration and visual diligence to ensure that we don’t overlook something important. But take care - there are many ways that a topic can be out of view; it might be outside the visible area, or filtered out, or folded up in a collapsed tree. There is no safety net. That’s easily solved, I hear you say. All you need to do is make lists in your map - a section for things to do today, a section for critical information, a section for open questions and so on. This works perfectly if you can devise a way to organise your stuff so that each item clearly belongs in only one place. Remember that a topic can have one and only one parent. This is fine for natural hierarchies, such as a breakdown of countries, counties, towns and districts. But the majority of the real world is not as nicely organised as this. Most of the things we deal with belong on more than one list at the same time. If I have promised to finish a report for my boss by next Friday, which list does it go on? The list of actions? The list of commitments to other people? The list of things to do by next Friday? The list of things connected with my boss? The list of reports to write? How about all of the above? If you are constructing lists within a map, this last option is not a practical one unless you are patient enough to create the same topic in five different places - and the novelty of doing that will vanish the first time you get it wrong. The conclusion is that visual maps are perfect for the big picture, and for making sense of information by organising it, summarising it, surfing it and manipulating it. 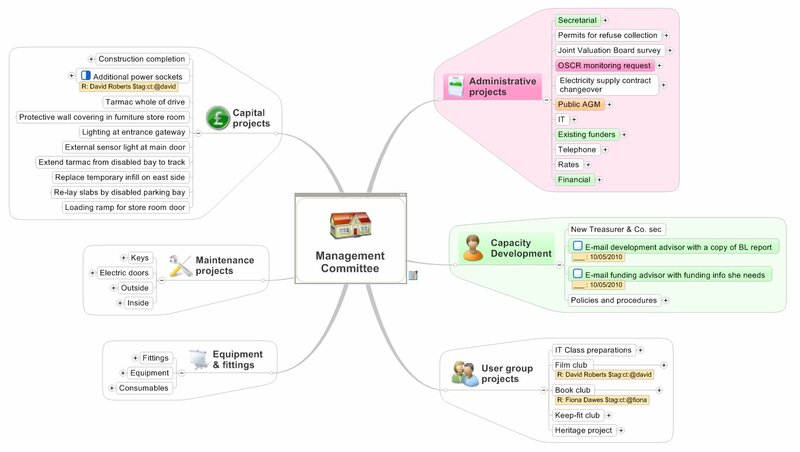 But visual maps become much less ergonomic if you want to keep track of the detailed properties of topics. Lists are far better for taking action and quickly assessing what needs to be done. So how do we get reliable lists out of our maps, without compromising the structure of the map itself? If you haven’t already guessed, this is what Power Markers for MindManager does. Power Markers is an extension for MindManager for Windows that adds a “Hot Lists” task pane, and automatically extracts lists from your maps. So you get not one but two views of the information in your map; the visual map for the big picture and navigation by context, and the cross-tree groupings that exist within your map, based on the map markers that you have used. 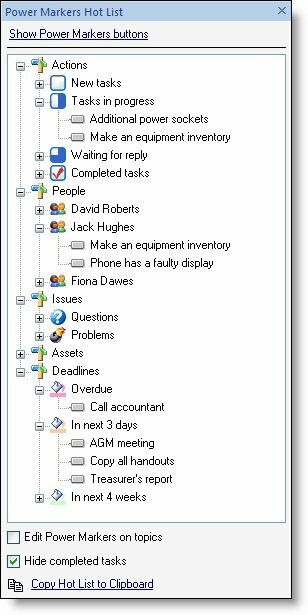 These lists group and sort topics by every property except context - colour, task status, icons and so on. Because this is a set of lists, rather than a tree of topics, it is normal for the same topic to appear on more than one list at the same time - so your “Write report” item is simultaneously shown on five lists, and you can find it by reviewing any one of them. When it is completed and checked off, it disappears off all five lists again. Power Markers can do a lot else besides. It can “roll up” important information to the centre of your map, greatly reducing the risk that you might overlook something vital. You can also design your map marker groups in the map itself, and make their definitions a richer part of your map. Power Markers Standard Edition will create up to 15 lists per map, and does not require a license key. If you use MindManager to organise information or keep track of activities, Power Markers will help you to get a lot more value out of your maps by being able to see them from two perspectives at the same time. Copyright © Harport Consulting 2010. All Rights Reserved.